In an article in Monday’s Straits Times entitled, “Report Card on Class of 2006”, journalist Li Xueying previewed the newest batch of PAP MPs. One particular quote regarding the grassroots work of Member of Parliament in Marine Parade GRC, Dr Fatimah Lateef, (right) has been given undue national prominence, by none other than Senior Minister Goh Chok Tong himself. 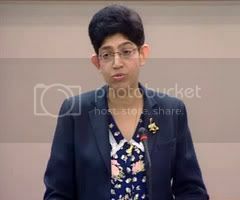 “At the grassroots level, though, a party cadre observes that she (Dr Fatimah) has had some trouble connecting with the Chinese temples in her ward over issues such as the granting of permits for the holding of events like gods’ birthday celebrations. Source confidentiality is not inaccuracy. It is one tool journalists use to obtain information that may be of public interest: otherwise, the source in question might not speak at all. An inaccuracy would mean that the source in question was misquoted, or quoted grossly out of context. It is understandable that Xueying would grant the source confidentiality at this source’s request: a party cadre is no ordinary grassroots member of the PAP. Cadres hold the right to vote for the Party’s Central Executive Committee (CEC). Source confidentiality does not mean a complete lack of journalistic accountability: Xueying has to account for the source’s identity and the quote’s veracity to her editor, and can be ordered to reveal the source in the event of a court case. SM Goh’s use of the word “inaccuracy” unjustifiably puts the journalist’s professional credibility in question. Contrary to criticism, such journalism needs to be encouraged. It is seldom that the public is privy to such frank comments about the PAP, and it is all the more impressive if the quote is obtained from no less than a PAP cadre. Reporters should not be bullied into shying away from obtaining sensitive quotes like these, and forced to write rosy reports about the PAP. SM Goh’s ire would be more constructively directed at the backbiting occurring in his grassroots organizations. The mischief he is imputing to the comment is no fault of the reporter: it was a quote sourced from a party cadre in his grassroots organization. If this whole fracas is blown out of proportion, SM Goh would be firmly responsible for the fallout. What might have been an honest assessment of Dr Fatimah’s shortcomings has been given sinister undertones by SM Goh in his attempt to bully the press. These dark imputations will now come home to roost where they belong: in his grassroots organization, not on the press.